Since the 1950’s, Weeks has invested in developing proprietary rose hybrids through its own breeding program. Weeks’ Research Department is dedicated to bringing you the best in all types of new rose varieties – whether from our own hybridizing or from the efforts of international breeding firms or amateur stateside breeders. Early in the history of the company, Mr. 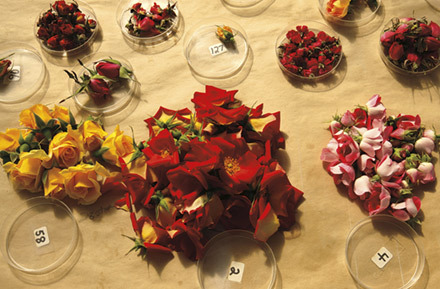 Weeks formed a partnership with the great American rose breeder, Herb Swim. They produced a remarkable group of new roses in that time--many of which are still in commerce. During this time AARS Award Winners such as Royal Highness (1963), Mister Lincoln & Camelot (1965), Angel Face & Comanche (1969) and Gypsy (1973) were introduced. Oklahoma was one of the first of the 'State' series. And the 'Talk' roses were amongst the forerunners of today's modern Shrub roses. After the partnership with Swim dissolved, Ollie continued the hybridizing program on his own. Weeks hybrids came to be known by their sturdy vigorous plants. His AARS winners were Perfume Delight (1974), Arizona (1975), Paradise (1979), Bing Crosby (1981) and Sweet Surrender (1983). One of the last roses to come from Mr. Weeks was our special 50th anniversary rose, Celebrity. Each year at our research greenhouses on the campus of Cal Poly Pomona, we hand pollinate about 50,000 flowers to produce around 250,000 seeds. After a thorough 8 to 10 year evaluation period only about 4 to 5 varieties emerge from the group as truly superior and market-worthy. To date, 14 AARS Award Winners have come from Weeks’ research efforts. Under the direction of Tom Carruth from 1988 until 2012 and currently under the direction of Christian Bédard. In the years to come, we will be bringing you many more excellent roses to grace your gardens.